RAYON HULA – is not only an award winning record but a live concert with ‘exotica’ video projection. RAYON HULA is my homage to the Hawaiian cool jazz / exotica musician Arthur Lyman and Ellery Chun creator of the Hawaiian Aloha shirt. This collection is made from samples of some of Arthur Lyman’s records, deconstructed, treated and reconstructed with lap steel guitar and/or electronics played across the top and with the repeating brightly coloured ‘looped’ patterns of my many Hawaiian shirts in mind. All the bird songs are live recordings that I made in Queensland, Australia. Originally released on my HIPSHOT cdr label it was subsequently released as a double ten inch vinyl l.p. record on CABIN records with covers lovingly hand silk-screened by Pete Fowler and Graham Erickson. Rayon Hula has been one of my most successful projects in terms of praise garnered, sales and leading to other projects. In 2005 it was a prize winner at the prestigeous Ars Electronica Digital Music Awards despite the original recording and mixing was being on a Tascam 4 track cassette recorder and two mini disc players. I’m very pleased to have this newly re-mastered version of the album available through ROOM40 out of Brisbane Australia. Rayon Hula is part of a trilogy of exotica works. Check out KIRIBATI and GLOBE NOTES. All three can be bought as a HIPSHOT TROPICAL TRIO box set. ‘Running his Hawaiian loops sweet and slow, Mike Cooper’s homage to Arthur Lyman is a masterpiece of contemporary exotica.’ – DAVID TOOP in the WIRE. ‘Recent attempts at resurrecting exotica by John Zorn and Tipsy have been a little too reverent for their own good..with zero soul or sincerity..RAYON HULA is the first truly sincere attempt at 21st Century exotica..a cool breeze of an album, experimental but eminently listenable.’ Jonathan Dean – Brainwashed. 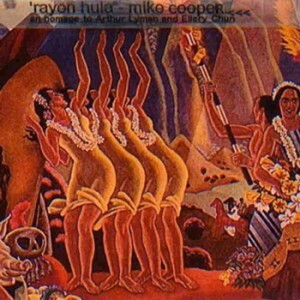 Rayon Hula is one of Mike Cooper’s finest works. Recognised by Prix Ars Electronica in 2005 as a seminal vision of expanded exotica, the record has since gone on to gather a rather substantial cult status. Now over a half a decade since it’s original limited edition release on Hipshot, Room40 makes Rayon Hula widely available for the first time, as an extended and completely re-mastered edition. – Room40 Records. Room40 reissue the British guitarist’s experimental album, dedicated (apparently) to the dubious charms of the Hawaiian shirt. Mike Cooper has been a figurehead of Britain’s blues, jazz and R&B scenes since the 1960s, leaning towards the avant-garde with later collaborations alongside Lol Coxhill, Keith Rowe, Eddie Prevost, David Toop and Steve Beresford. More recently, Cooper recorded an album for Room40 with Necks pianist Chris Abrahams, but this recording takes us back half a decade or so to a collection of solo, exotica-influenced electroacoustic experiments. Cooper’s fixation on all things Hawaiian extends back to the 1980s, but this solo outing is one of his most exploratory works in the field, melding lapsteel and slack-key guitar styles with electronic loops, processing and field recordings collected in the Pacific. The music skirts between Philip Jeck-like crackle and loop manipulations (such as ‘Caught Inside (For Daniel Duane)’ and the skittering beat-scapes of ‘Kokoke Nalu’, but all the while Cooper’s musicianship as an accomplished guitarist shines through. First issued on his own DIY label, Hipshot Records, Mike Cooper’s distinctive Rayon Hula is an experimental, ambient album that’s lo-fi and laid-back. Cooper is a British guitarist/producer whose roots lie in the U.K. R&B boom of the early 1960s. He offers copious lap steel guitar that soothes and transfixes; it colors Rayon‘s already-unearthly wash of sampled birdsong and field noises that the artist collected in monsoonal Queensland, Australia. At Rayon Hula‘s base is evidently a tribute to exotica, a warm, provocative genre born in Hawaii, back when it “really might as well have been another planet, a distant clime ripe for exploration” (“Exotica: It Takes a Village,” Nate Chinen, 23 September 2009). In the 1950s, exotica’s founding fathers managed to incorporate non-traditional percussion instruments, jazz, and bird calls into their work, and the legendary Arthur Lyman was one such musician. Mike Cooper calls his album an homage to native Hawaiians Lyman and Ellery Chun, the latter of whom developed the “aloha shirt” in 1931 after he finished the economics program at Yale. Snare rim shots and breezy vibes borrowed from Arthur Lyman’s catalog are looped for Rayon Hula‘s background. Cooper carefully treats these samples, augmenting the new textures with spacey effects and his guitar. “Paumalu (Sunset Beach)”, as you might have surmised, lulls all the way through—it’s as easy to get lost in as the relics in Cooper’s record crates. 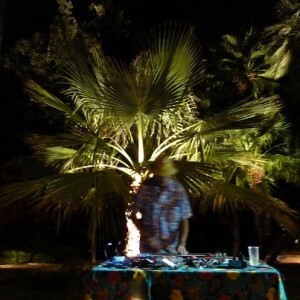 “Typhoon Lagoon”, however, is entrenched in venturesome, contemporary electronic music, where hisses and sample manipulation are as critically important to Rayon Hula‘s essence as the author’s unique, cherished influences. Room40 publie des disques physiques (celui de La Casa, par exemple), mais aussi des albums offerts uniquement en téléchargement, comme cette réédition remasterisée de Rayon Hula, L’œuvre avant-exotica qui a valu à Mike Cooper un prix Ars Electronica en 2005. À partir des disques de jazzman exotica hawaïen Arthur Lyman et en s’inspirant des motifs de sa collection des chemises hawaïennes (je n’invente rien! ), Cooper a composé un disque hybride qui intègre parfaitement électronique ambiante et exotica. Disons, pour donner une idée, qu’il s’agit d’une version hawaïenne d’Endless Summer, l’ode rétro-surf de Fennesz. Mais il n’y a pas d’imitation ici (et Fennesz ne travaillait pas à partir d’échantillonnages). Très heureux de découvrir ce disque, même cinq ans en retard. – ERIC LA CASA. 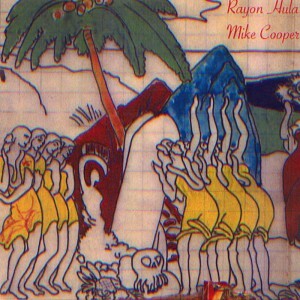 Spending time inside Mike Cooper’s Rayon Hula is akin to entering another world. The fact that the British blues guitarist and experimental composer’s lush musical terrains are in part derived from Australian field recordings and artefacts makes this glimmering piece of exotica all the more seductive. The infamous 2005 recording, extended and remastered in this edition, effectively recasts 1950s Western imaginings of Hawaii and the Pacific as a layered, postmodernist melange. Infusing lap-steel guitars, electronic textures and field recordings of Queensland birdsong into a palette of looped samples of late exotica artist Arthur Lyman, Cooper not only pays homage to the genre, but abstracts and expands its haze-riddled atmospheres. The results are intoxicating. Kokoke Nalu’s looped vibes, swirling lap-steel and shuffling rhythm are pure joy, while Paumalu’s sun-drunk ambience is so breezy you could drift away. Cooper’s alluring revision of the Pacific may prove more challenging than its precursors, but it’s all the more rewarding for it.